Years ago on e-day I had the pleasure to see a talk of Gary Vee. If you have ever seen Gary Vee or not, if you are in marketing, sales or any other business you should at least see this guy once. 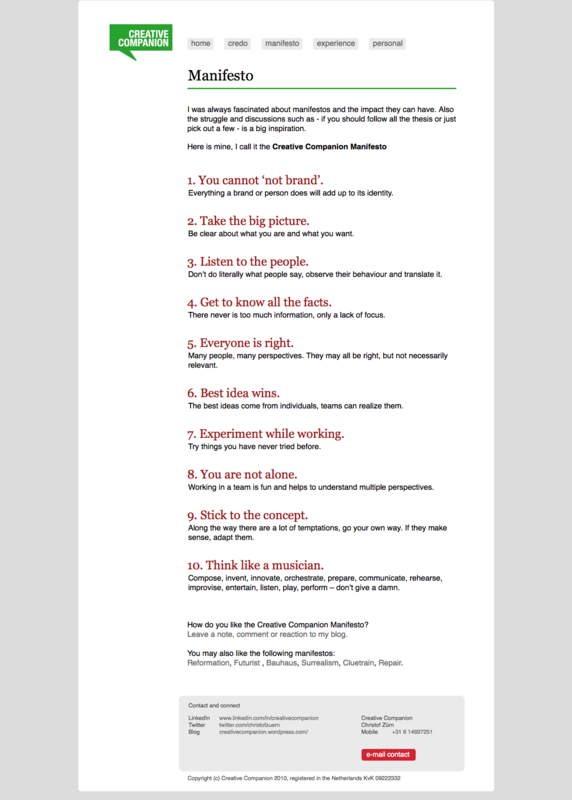 Here is a (one year old) talk he did at Inc 500 – it is amazing and funny. Don’t skip the last few minutes, the Q&A and the end is also really worth all your time. Here are the things he is mentioning, but you better watch the whole 1 hour. It is all about long term value, not about the spend you get right now. We call every single customer who places an order and thank them – and that’s it! how much thank you economy stuff are you doing with your people? this social media game is not about talking: you need to wire your mouth shut and start using your ears. Because that is the game in play. retention is the game, life time value is the game. What is the real ROI of social media, what’s the ROI of your mother? The ROI of my mother is everything, I can’t show you in data the ROI of my mother but i promise you it is all of it. 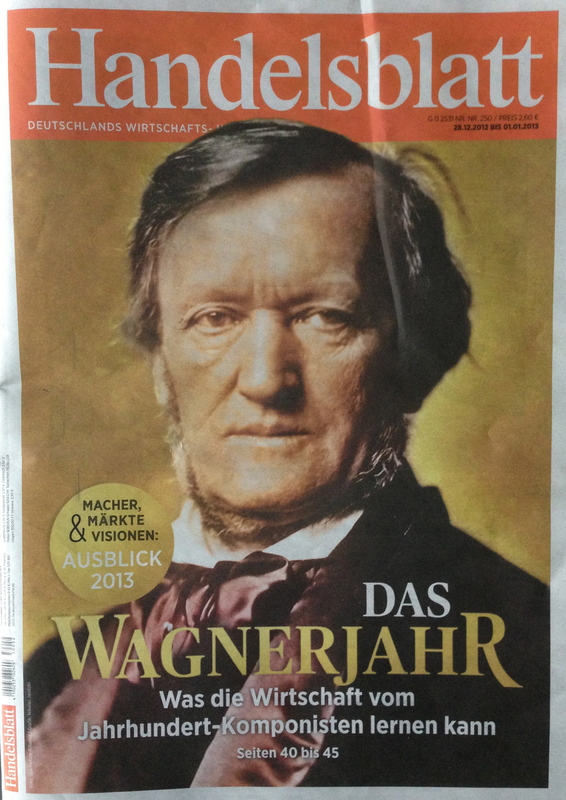 The world will celebrate the 200th anniversary of composer Richard Wagner, this makes 2013 ‘the Wagnerjahr’. 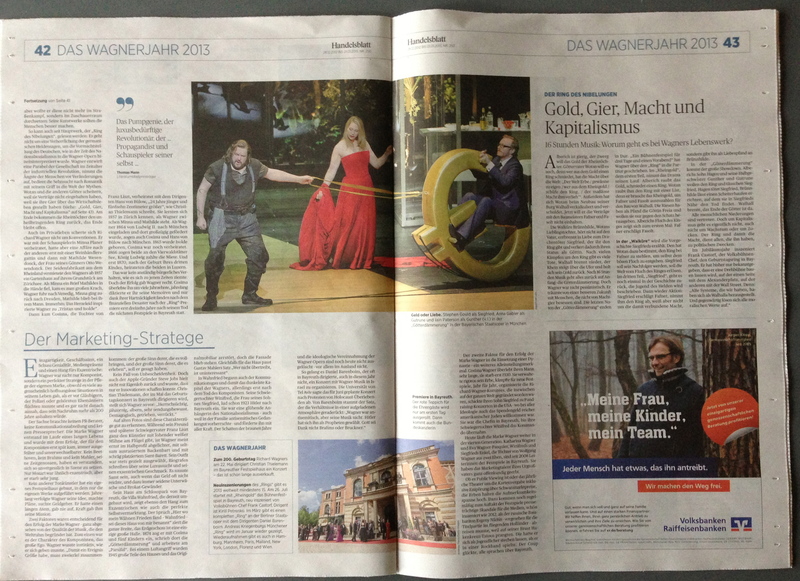 In their last edition of the year german financial newspaper “Handelsblatt’ is also focussing on ‘all the things to come’ and dedicated the cover story to Richard Wagner. The story illustrates the many perspectives of Wagner: the innovator, the storyteller, the free spirit, the entrepreneur, the marketing strategist and I would like to add the ‘Music Thinker’ (more on music thinking see below). The visionary Wagner was driven by his mission to change the world with his idea of the innovative music drama into a unique ‘Gesamtkunstwerk’. To realize his goal he was able to ‘think as a musician and act as a designer and entrepreneur’. He used his many skills without any compromise against all odds and struggles along the way like a 19th century Steve Jobs. He designed the interior of his music hall in Bayreuth with the focus on acoustics above comfort: the simple chairs are made from wood (fabrics would absorb the sound), the musicians are hidden in a deep orchestra pit so the audience would not be distracted, there is no heating and no climate control. When Wagner began to write his masterpiece – the 16 hour lasting ‘Der Ring des Nibelungen” – he was 34, at the world premiere in Bayreuth he was 63. The story is about love, power, leadership, greed, betrayal, ruin and destruction; or as conductor Christian Thielemann put it ‘what happens when modern man is losing sight of himself while striving for property and wealth’. There are many connections possible with our modern world and politics. 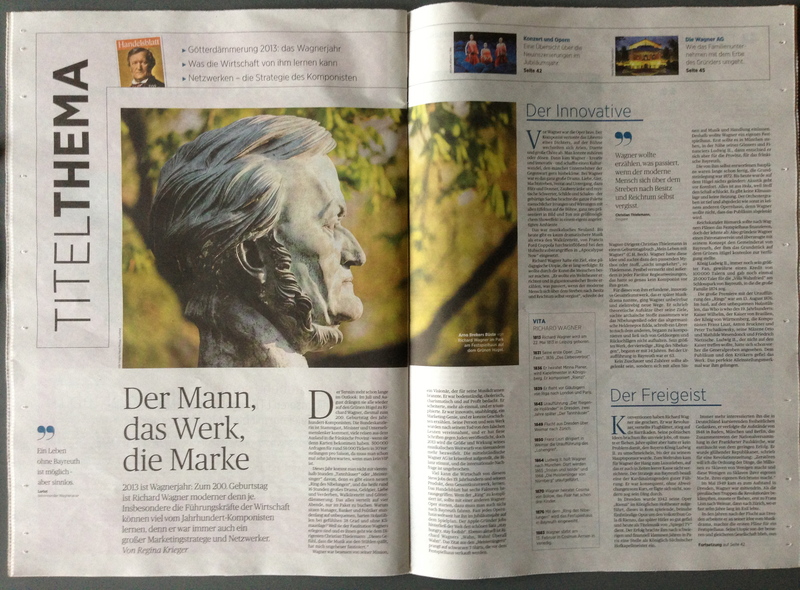 Every year captains of industry and politicians like Angela Merkel sit side by side to experience the man, the music and the brand Richard Wagner – hope they get inspired to hear, see and do the right things in the context of our Gesamtkunstwerk. Interesting that the Financial Crisis is on it’s decline (at least in search volume nota bene), Service Design and Richard Wagner are meandering through the year with two peaks for Richard Wagner; Music Thinking is still a ‘hidden secret’. You can help to change this in 2013 with tweeting #musicthinking for inspiring ideas in music and beyond!